Actually, not all that new, but new for around here, and certainly not at all common, the idea of a passive house is that it uses sunlight and sealing to produce a building envelope that requires little or no external input for heating and cooling. Buildings account for somewhere around forty percent of the carbon dioxide that we emit into the atmosphere, contributing to the greenhouse effect and climate change. By using improved construction techniques and sealing the building envelope, combined with circulation and heat exchange on stale/fresh air, it is possible to reduce heating and cooling costs by ninety percent. In addition, there are clear paths to retrofit existing housing stock. Our own Guy Langlois spoke on this at an energy and housing forum we hosted several years back and it would be wonderful to see a demonstration project up and running locally. There is a shining example of the idea of a zero-emissions house, but it’s in the Highlands, down Langford way, so a little bit out of the way. 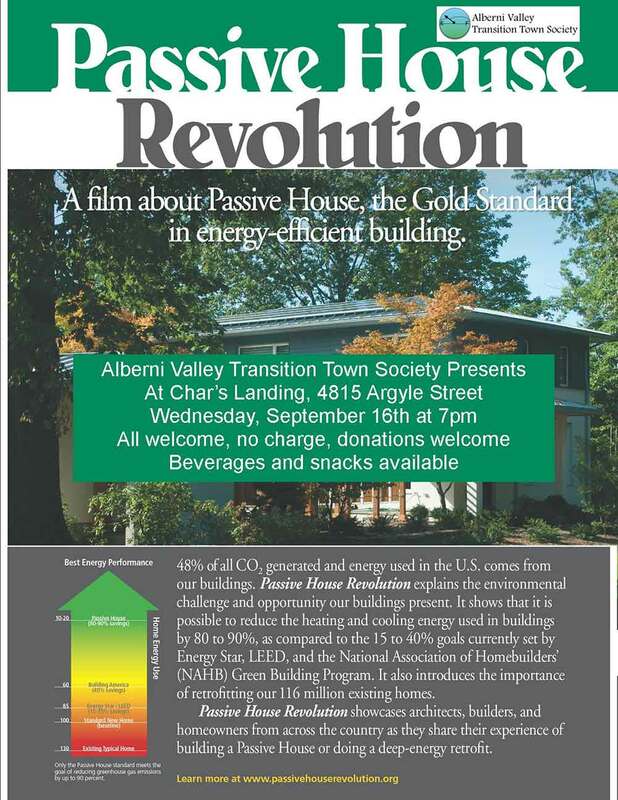 The film Passive House Revolution, from Community Solutions, outlines a variety of projects and approaches to low-energy construction.